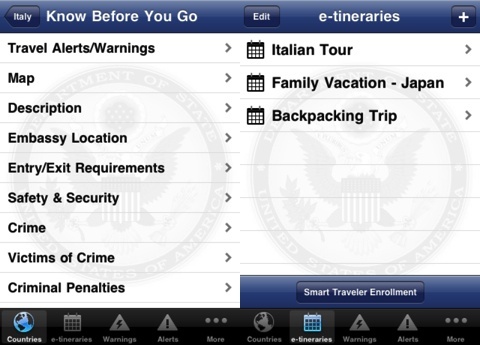 The Smart Traveler app for iPhone and iPod Touch is a comprehensive resource for worldwide travel produced by the US Department of State. It contains an incredible wealth of information packaged neatly with intuitive, straightforward navigation. The Smart Traveler iPhone app is crammed with information and movement to multiple screens is required, but the intuitive navigation tools bring together web-browsing and iOS functionality nicely. The home screen is an alphabetical listing of countries with a search bar to customize your search. When you select a country with a touch on the screen, a list of categories appears. You touch the category, and there is an excellent, thorough, accessible narrative with helpful information. As you navigate into the Smart Traveler iPhone app, you can always touch the arrow at the top left of the screen to go back. You can also navigate to different feeds of information by selecting an icon from the menu bar at the bottom of the screen. You can select to explore countries, e-tineraries, warnings, alerts, and more with just a touch at the bottom of the screen. The Smart Traveler iPhone app’s content is amazing, thorough, and informative. You can explore a country’s history, specific locations with crime problems, links to foreign government offices for you to purchase a permit to go to a wildlife reserve, visa information, medical requirements, problems in neighboring countries that may impact your travel plans, detailed economic history, maps, and much more. For each page of information in the Smart Traveler iPhone app, you can email the information in one touch. The Smart Traveler iPhone app also contains additional interesting features. If you are traveling to a particularly complicated, hazardous country or just to France, you can create and submit your e-tinerary to the local U.S. Embassy or Consulate. Travel Warnings are presented in a list format and contain pertinent details navigated with simple touches on the screen and scrolling. The Travel Alerts icon contain current alerts with specific expiration times and currently includes Hurricane and Typhoon Season details. If you travel for business or pleasure, the Smart Traveler iPhone app is a must-have download from the iTunes App Store. It is a simple, easy, insightful, and relevant resource for a traveler of any nationality. 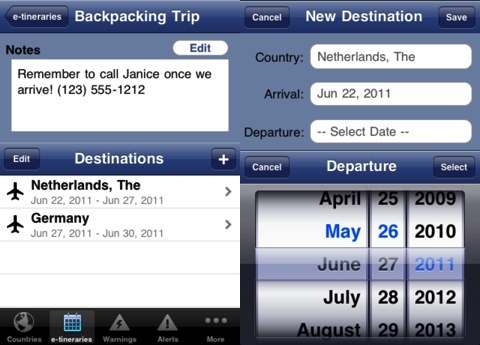 AppSafari review of Smart Traveler was written by Jenni Ward on July 19th, 2012 and categorized under App Store, Free, News, Reference, Travel. Page viewed 4630 times, 1 so far today. Need help on using these apps? Please read the Help Page.